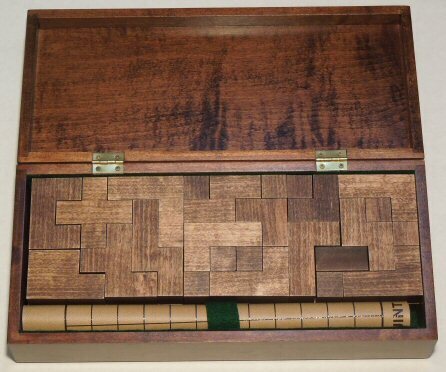 The beautifully matched set of 30 blocks was cut from a single piece of solid maple. Our packing pattern for the "super deluxe" box has the 12 quints in a separate double-decker block, and the 18 superquints as two separate smaller blocks, so you can use just one set at a time until you're ready to tackle the full combo. Yes, a solution sheet for this arrangement is included.